This volume of fifteen original essays examines the role of political institutions in establishing democratic stability around the globe. Leading scholars survey well-established democracies, such as the United States, Great Britain, Canada, Australia, and France; relatively established democracies, such as Germany, Italy, India, and Israel; and newly established democracies, such as Turkey, Poland, and Spain. 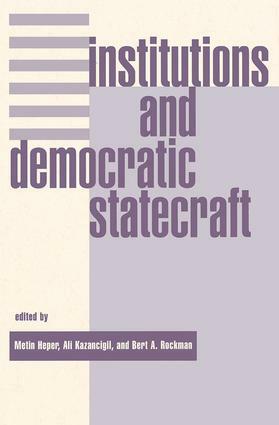 The final chapter explores how political institutions may be connected to democracy for best performance of the political system. Political Institutions And Democracy * Introduction Metin Heper. * Institutions, Democratic Stability, and Performance Bert A. Rockman. Well Established Democracies * Gridlock and the Crisis of Leadership in the U.S. Colin Campbell. * British Democracy and Its Discontents Graham Wilson. * What Kind of Democracy Do Canadians Want? Michael Atkinson. * Institutional Reform, Rationalization, and the Transformation of Australian Democracy Mark Considine. * Stability and Representation in France Valerie Rubsamen. Relatively Established Democracies * Institutionalizing Democracy in Germany: From Weimar to Bonn and Berlin Hans-Ulrich Derlien. * Freezing, Adaptation, and Change in Italian Democracy Leonardo Morlino. * Surviving the Odds in the Case of Indian Democracy R. B. Jain. * Transforming Israeli Democracy Under Stress Fred A. Lazin. Newly Established Democracies * Constitution Making and Democratic Consolidation in Turkey Ergun zbudun. * Division or Cohesion in the Polish Executive and the Democratic Order George J. Szablowski. * Managing Democratic Consolidation in Spain: From Consensus to Majority in Institutions Richard Gunther. Conclusion * Connecting Political Institutions to Democracy Ali Kazancigil.